It is not pretty, but it works. The Historical Data Display (which causes the logging to occur) is on the common window screen (So that logging occurs no matter which screen you are on at the time) and would normally be hidden from view (if logging only was required and no display of data). This causes LW0 - LW7 to be logged to the USB stick every second. 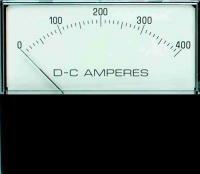 The frequency could be modified or change to occur on demand (Background attribute tab of Historical Data Display). Firmware version 8.10 for NS. Includes 'new' ladder monitor web server Tag access for CJ2. 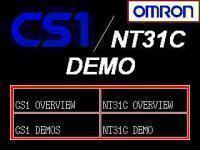 Attached file is sample basic HMI application for Omron NT series HMIs. screens don't fit (NTST menu Windows Symbol Manager). Note when creating keypads they have to be in "1-3999 (Window/Keyboard)"
while normal screens are in folder "1-3999 (Standard)"
specifies focus type (i changed it from flashing inverted to just inverted). (Input Key window/keyboard specify keyboard screen number). you can have different functions assigned to touch switch. pay attention to cursor location or you may end up overwriting wrong value. objects on screens interact with tables (numeric string etc.). tables contain reference to PLC memory locations. 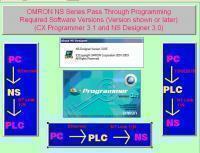 NS Project designed to illustrate the setup for pass through programming to the PLC via Ethernet commection. Sample NS project which demonstrates the use of indirect addressing for labels. Demonstrates the major features of the NS7 Touchscreen. Can also be loaded to NS8 and NS10 touchscreens. 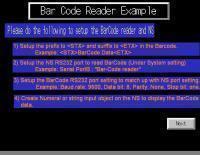 Includes CX Programmer ladder code. 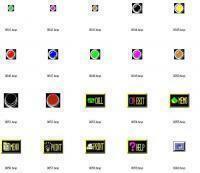 Another small collection of guages and selector switch bitmaps. Can be use with Omron OI and others. Collection of lamps pushbuttons and rocker switches for Omron OI. Can be used for other OI and Scada applications. Various screens designed to demonstrate elements from the NTST 4.1 Touchscreen software package.